The author of the pick-up artist’s bible has a new board game. But don’t expect him to hit on you. I’m a bit disappointed when Neil Strauss doesn’t hit on me. Not that I usually enjoy being hit on, nor do I expect the romantic attentions of my interview subjects. But this is Neil Strauss, the journalist and author of the bestselling book, The Game, which launched the language of the pick-up artist into the everyday lexicon: Words like “sarge” (going out to get women) and “negging” (backhandedly complimenting a woman to make her feel insecure). This is the man who once wrote about how he practiced his techniques on every girl he met, if only to keep up to speed, a man who once gamed Britney Spears while he was interviewing her. To be not hit on by him feels almost insulting. 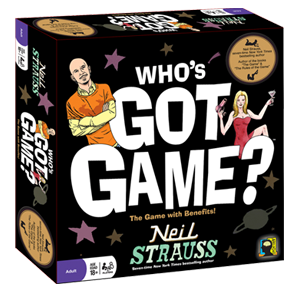 Strauss is promoting a new board game called “Who’s Got Game?”—the game of The Game. The box is decorated with a caricature of Strauss, with his signature goatee and shaved head, and a woman in a slinky red nightie holding a martini glass in one hand and blow-dryer in the other. “The Game with Benefits!” it proclaims. As we speak, Strauss drops some hints of the debauchery and celebrity of the life he described in The Game. He’s constantly putting me on mute, as if there are untoward sounds in the background that my virgin ears must be shielded from. “Thanks for coming by, Amber,” I hear him say, before the phone goes silent again. He casually mentions that he’ll be bringing the board game over to Moby’s house (a Hollywood castle) that night. Oh, and he’s trained FBI agents how to use The Game to tease information out of suspects and recruit informants. Strauss is quick to point out that men in the pick-up community aren’t naturally suave. The reason they gravitate to cheap tactics, and an online community that shares and disseminates them, is that they aren’t having success with women. The Game was presented as a game precisely because it was for men who were more comfortable with games than girls. “Most of the routines are not about tricking anyone, except tricking yourself into being comfortable around women,” Strauss explains. Fittingly, the first prototype of “Who’s Got Game” was built by cocreator Adam Kornblum in order to meet people at bars. Toward the end of the interview, I admit I’m a bit miffed to be looked over by a guy who once picked up a woman from whom he stole a parking space. But Strauss says that it’s simply the nature of his situation, post-Game: “It’d be so incredibly cliché and cheesy to game you.” It’s not quite a neg, but I’ll take it.